A new pattern! I haven’t published a new pattern since…uh…(shuffles papers) June. Wow. June! Anyway, this is almost cheating since this pattern has been ready to go since the beginning of the year, but it’s so satisfying to get it published and complete. 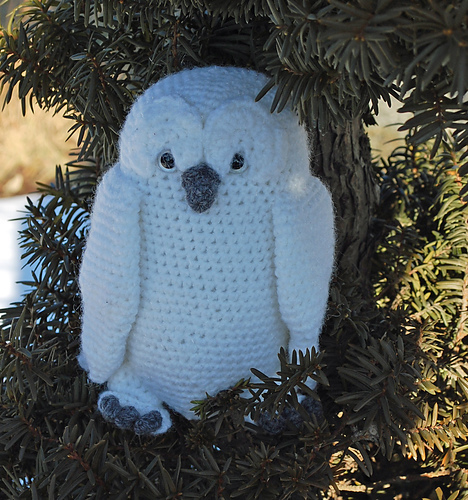 It’s a great snowy owl, and I designed it to enter in a Harry Potter – themed crochet pattern contest in the first part of the year. (Alas, I did not win.) The pattern is available to purchase over at Inner Child Crochet, for those interested. I really like it. Interesting story, this owl is based on a stuffed owl I’ve had for more than a decade. My older sister and I were in a book and toy store – I think I was about twelve – and I just had to have the book of Klingon novels and the owl. (It’s really a gorgeous owl.) I didn’t have enough for both, and I begged my sister for the money to make up the difference. She let me have it, and as a result couldn’t buy something for herself that she wanted. 9 Year Celebration – Pattern Giveaway! SO CUTE!!!! I think it’s more Xmasy than Harry Pottery. Remember Holly & Ivy? Although that owl was brown and evil right? Hm, maybe HP it should be! Your owl looks wicked awesome!